Known as “Bulgaria’s UFO”, the Buzludzha Monument hides in the Balkans as the former Bulgarian Communist Party Headquarters, and has become one of the most unusual spots in the country. I did some urban exploration at this fascinating site to find out more about this curious attraction. Perched on top of a bald hill surrounded by rolling mountains and forested gorges, the abandoned Buzludzha Monument is one of the most unusual sights in all of the Balkans. Often referred to as Bulgaria’s UFO, the Buzludzha Monument is a stunning, impressive and hypnotic testament to Soviet development and control. Located on the historical Mount Buzludzha, the construction of this concrete monstrosity was completed in 1981 at a cost of over 14.1 million Bulgarian Lev (or about 7.2 million Euro). Its position was not chosen by coincidence. Mount Buzludzha is the site of the famous final battle between Bulgarian rebels and the Ottoman Empire in 1868. This was also the exact spot where in 1891 socialists, led by Dimitar Balgoey, assembled on the peak to form the Bulgarian Social Democratic Party, which was the forerunner to the Bulgarian Communist Party. It became the house of the Bulgarian Communist Party, or the Bulgarian Communist Party headquarters. However its purpose was always intended to be just a monument to past events, and designed to remember the progression of communism in the country. When the Soviet Union collapsed in 1989 the Buzludzha Monument was abandoned and all funds designated to its upkeep were diverted elsewhere. Graffiti inside the monument – Lurkers of the world, unite! Over time it has fallen into a state of disrepair and become a popular destination for urban explorers and those with a curiosity for these fascinating abandoned communist buildings. The Bulgarian government has been doing its best to deter people from breaking into its interior, constantly installing steel bars and placing security guards at its doors. However it cannot always be protected, and no sooner has one bar been put up, another hole is smashed into it. Unfortunately the Buzludzha Monument is falling apart and getting more and more dangerous as vandals continue to damage the building. Two Frenchman even died inside Buzludzha a few years ago. It’s only a matter of time before this place is closed permanently, or it is turned into a museum, as it should be. For now it remains as one of the most off-the-beaten-path destinations in Bulgaria, and one of the coolest things to do in the Balkans. The Buzludzha Monument, perched like a concrete UFO on the top of Mount Buzludzha. I had heard stories of its existence and had always been intrigued by it. A concrete UFO hidden in the mountains? Take me there! Fellow travellers had talked to me about communist urban exploration, and I knew that if I ever found myself in Bulgaria that the Buzludzha Monument would be at the top of my list. While Alesha was back home in Australia I decided to leave Turkey and move into the neighbouring nation, officially entering the Balkans. My first destination was Plovdiv, a vibrant and picturesque town that had been nominated as the “European Capital of Culture” in 2019. As it was coming into winter the chance to meet other backpackers was dwindling, and I found myself almost alone at the best hostel in Plovdiv, The Crib, for my entire stay. Not wanting to visit Buzludzha on my own, I waited patiently until there were more explorers to go with. A cannon pointed over the Balkans – located at another spot near Mount Buzludzha. After an exciting and busy Christmas in Sofia, the Bulgarian capital, I met up with some friends and we decided to head back to Plovdiv and explore the Buzludzha Monument. The 5 of us teamed up and rented a car, aiming for the peaks of the Balkans on a late-December morning. The air was crisp and the sky was blue. The mood was jovial. We were ready to find Buzludzha. We snaked and twisted towards the Central Balkan Mountains, spending our time joking around and simply gazing out at the Bulgarian countryside as it passed by. After only an hour we reached the bucolic town of Shipka, home to a magnificent pink and gold church. While our intentions were well and truly set on the Buzludzha Monument, visiting the Shipka Memorial Church was an excellent cultural sidetrip to break up the journey. This Bulgarian Orthodox church was built between 1885 and 1902 and soars to a height of 53m. It is dedicated to soldiers who died for the liberation of Bulgaria in 1887-1888. The bells inside are cast from cartridges recovered from the Russo-Turkish War, which took so many young lives. The sun was rising higher in the sky and we launched the car the final 10km to Mount Buzludzha. One particular bend in the road afforded us our first view of the UFO, and we let out collective sighs of awe. There it was, in all its glory, capping the top of the mountain like a misplaced hat. We could barely contain our excitement, and sped up the twisting roads. Halfway up Mount Buzludha we came to a powerful symbol of Soviet control, and had to stop to admire its audacity. Two large iron fists holding flaming torches created a dazzling spectacle. When it came to authoritative signs, the Soviet Union knew what would intimidate the people. Iron fists and the UFO in the background. With our photos snapped we continued up the mountain, closing in on our goal. We parked the car and couldn’t take our eyes off of it. Rather than running up the stairs like I had envisioned, filled with excitement to finally be here, we all stepped thoughtfully towards it. The bizarre concrete UFO demanded respect and caution. With each metre gained the Buzludha Monument rose higher and deeper, casting an imposing shadow over us. Instead of rushing for the interior, we respectfully did a lap of the outside, admiring the graffiti that has been plastered over the monument in recent years. These stylised pieces of art formed powerful statements that captured our attention and conversation for minutes at a time. Never Forget Your Past. It used to say “Forget Your Past” until it was painted over and rewritten with the “Never” in it. Once we had admired the exterior we tried to find our way inside. The large steel doors that mark the official entrance have long been bolted shut, and it took some searching to find a new way in. To the right we found a small gap in the concrete that had been demolished by previous urban explorers. I have since been told that the government regularly closes up these makeshift openings, trying to deter people from visiting. Today, however, we were lucky. With some simple climbing and a step over a long, slightly dangerous drop, we were finally inside the Buzludzha Monument. My friend Lilia climbing into the monument. Beams of light dissected the debris-strewn basement, and it felt as though we had stepped into forbidden territory. Broken bottles, chipped concrete and pieces of re-bar littered the floor, and we had to remain vigilant as we made our way out of the darkness and into the impressive auditorium. Up the dilapidated staircase, and we were inside the most iconic part of the Buzludzha Monument. A surprisingly clean, white marble floor spread out beneath a domed ceiling that had begun to partially collapse from years of neglect. Circular seating surrounded the room, and detailed mosaics of Communist heroes adorned the entire wall. The roof allowed sunlight to penetrate the auditorium, and the symbolic emblem of communism, the hammer and sickle, remained almost intact in the centre. Each footstep echoed around the auditorium, and we could envision the room filled with the voices of Soviet powers screaming propaganda at dedicated listeners. We continued our exploration, walking around the mosaics and studying them intently. Vandals had removed many of the tiles, and tags were painted over some of the faces. Clearly without restoration this place would fall into complete decay. A final lap on the surrounding exterior gave us views through open windows and we admired the soaring tower above. Looking out the edge of the UFO. We knew it was possible to climb 107m to the top of the Red Star, and we rushed off to reach it. Back to the basement we found a small entrance that led off into the darkness. Stepping along narrow concrete pillars we ventured deeper into the bowels of Buzludzha, eventually hitting a series of ladders. At this point it was almost pitch black, and we were forced to use our phones to create light to see our way. Climbing the staircase, nearly at the top. Rung after rusted rung, we climbed higher into the guts. Eventually the ladders transformed into steep staircases, and we spiralled our way up the tower. Numbers marked the floors we were reaching – 9, 10, 11, and so on – and we kept climbing until we were progressively bathed in bright light. The Red Star materialised, embedded in the concrete, and we could see the peaks outside the tower. We were high above Mount Buzludzha, with still more altitude to be gained. Reaching the light as we climbed the tower. Rumours had been spread in the past that the Red Star was actually made of rubies. I picked up a piece of broken red glass from the ground and examined it. There was nothing precious or valuable about it. Clearly this rumour had been spread by those in power to talk up the wealth of the regime. I pocketed a piece of the glass as a souvenir, and climbed higher. Looking out the Red Star. One final flight of stairs broke us onto the roof of the tower, and we had made it to the top of the Buzludzha Monument. The views from the top were simply incredible, and we stared out into the Central Balkan Mountains, wondering what other strange monuments lay in the forests. Some corroded scaffolding surrounded the edges, and desperate to reach the “highest” point of the tower I climbed and stepped onto the concrete walls. Shuffling out to the far edge, I looked down at the desperate and sudden drop beneath me. Catching some selfies I sat down to admire the rest of the vistas. Out on the edge of the tower. At some point we checked the time and realised we had spent almost 3 hours at the abandoned communist monument and decided to leave before the winter day ended abruptly. Scaling back down the tower, through the decrepit interior and out the chipped concrete, we were safely arrived back at the car. Our group piled in and made our way back to Plovdiv, but not before making a detour to another monument, this time turned into a museum. Another monument, this time turned into a museum, near Mount Buzludzha. A few hours later we had arrived back at The Crib in Plovdiv, and excitedly talked about how amazing the day’s urban exploration had been. We cracked some beers to celebrate and discussed how many other fascinating abandoned Soviet monuments must be scattered throughout the Balkans and the former Yugoslavia. Quietly I made a goal to myself to visit as many as possible. But for now I was happy with the Buzludzha Monument being my first foray into this side of incredible communist structures. There are a bunch of different ways you can get to the Buzludzha Monument , but we feel that renting a car is the best way. Note that there is no public transport to Mount Buzludzha. The closest villages to stay in near the Buzludzha Monument is Shipka and Kazanlâk. You can take local buses to these towns, and then hire a taxi to get out there. Getting to Buzludzha from Sofia will take about 2.5 hours, making the entire a day a large mission. Personally we think the best way is to get to Buzludzha from Plovdiv, which is a lot closer and has a great number of options to rent cars and accommodation. The drive out to Buzludzha from Plovdiv should only take 1 to 1.5 hours. Stay at The Crib for some great tips from the owner, Joscko, on how to get out there and what else to see in the region. If you want to stay somewhere else then Plovdiv has a huge number of great accommodation options. Click here to book your accommodation in Plovdiv. Is this still possible to do? I heard you can not get inside anymore because of guards? 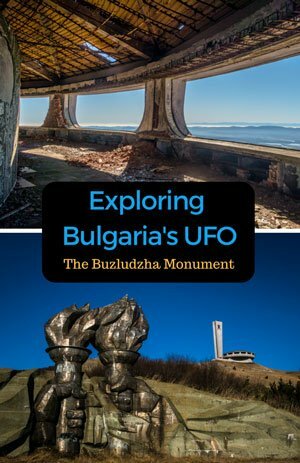 Hello guys, this is a great story about Buzludzha, it is really and amazing place in Bulgaria. I am Maria, a Bulgarian travel blogger and I want to make just a small correction about facts. The liberation wars in Bulgaria happened in 1877-1878, instead of 1887-1888, and the name of the first socialist leader was Dimitar Blagoev. After reading your post about this months ago we’ve finally arrived in Plovdiv and were set to go and see the Buzludzha. Sad news though, it’s basically inaccessible now. A few months ago the ownership was passed onto the socialist party of Bulgaria and they have turned the security up ten fold. Since this increase in security all entrances have been bricked up, there is a monitored alarm system and roaming security guards. So, if you want to go inside you have to have a sledge hammer or go in the days after someone has used one. Then once inside and into the main building you’ll set off the alarm and have only 15 minutes until a security guard arrives from the closest town. Sad times for urban exploring. Just thought we would let you guys know. Hey guys! Yea we have heard about the new developments there with people not being able to get in. Such a shame. A few of our friends managed to break in a couple of weeks ago, but I don’t know how often that happens. Maybe one day they’ll turn it into a museum, but you’re right – a sad time for urban exploring. Do you happen to remember the position of the sun as you approach and from the main entrance? We plan to sleep in Shipka so can visit morning or afternoon but are trying to figure out the best time for photography…. Many thanks! This is probably really too late of information now, but I have just visited the site today. I can tell you that you will probably not have much trouble most of the day. I don’t remember the exact position of the sun in relation to the horizon, but I took some spectacular photos full of blue colors (using a polarizing filter) that were not washed out between 11 am and 12 pm. I think that no matter what time of day you go, you will not have much trouble with the weather. Additionally, I was able to get into the monument through a hole in the ground. You have to drop down about 2 meters and then shimmy down a very rickety and not so securely placed ladder. It’s quite treacherous and I must say that anyone who wishes to do this should not do this alone and should be wearing sensible shoes. I saw one couple wanting to go down in sandals. Definitely not a good idea. I did not see any guards and I did not stay inside for very long. I was afraid that the other people who had gone in right before me would leave and I would not be able to pull myself out of the hole (I have no upper body strength). Daniel.. I was informed that the at the in August the hole in the ground was loaded with stones (and probably sealed with concrete) and cameras and moving sensors installed. When did you go last time?